Long before Tootsie gave us a pop or Kinder hatched their eggs, kitchens in Naples surprised us with arancini, or “little oranges.” The recipe is quite simple. Gooey rice wraps around something tasty and forms a ball. Then these delicious treats bob in a fryer until they gain the perfect crunch. Typically Italians embed a hunk prosciutto cotto (cooked ham) and maybe some cheese. If you ever wander the streets of Naples, don’t hesitate to savor them from a street vendor. It is part of the immersion process. The good people at Cherry Street in Austin TX, as with many Americans chefs, update classic Italian recipes. 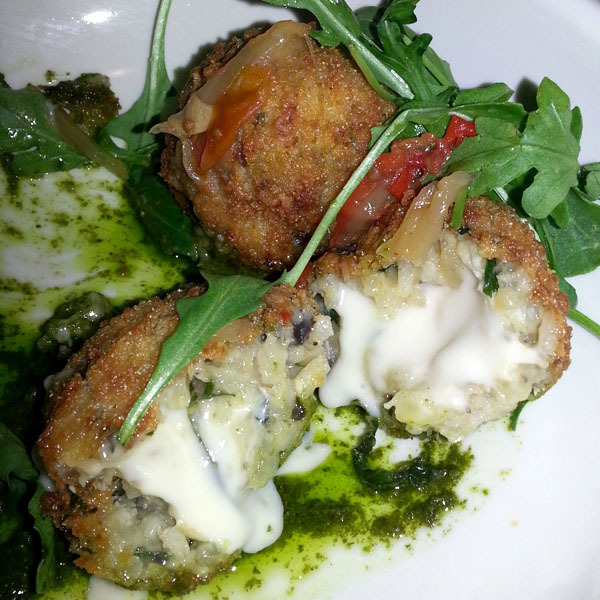 With their version of arancini, diners witness molten blue cheese ooze when the shell is cracked. The whole dish is served on a plate painted with basil pesto, accented with roasted red pepper, then sprinkled with arugula. Yes, when the egg opens to reveal the brilliant white, we have the color palette of the Italian flag. What’s fascinating about arancini is that it’s made entirely of leftovers. Scraps from the prior day. Yet we experience it new and fresh. And it’s easy to make. The anchor is the sticky rice. For Italians, it’s the arborio variety used to make risotto. It could be sushi rice. Doesn’t matter. It just needs to be glutenous enough to stick together. From there, consider what ingredients might hide inside. How about the abandoned asparagus with a chunk of smoked Gouda? Or maybe the forgotten hickory-smoked bacon with cubes of butternut squash? Go ahead look in the fridge to see what’s possible. Best of all, even if you tell your diners what’s coming, they will never see it hit them. There is magic in a wrapped package. Now that we’ve teased your imagination, tell us in the comment field about your experience. What did you hide to the delight of your diners. What little treasure did you find? So simple yet so delicious! I love the layers of texture and the element if surprise.